Texting Base offers a scalable SMS-based, text message marketing platform with scalable package options all the way up to enterprise-level deployment. Businesses sending 1,250 messages per month, all the way up to those sending 5 million, can access a system that promotes a spam-free approach to reaching out within a customer base. Boasting patented technology for making every text message personalized and therefore more engaging for the recipient, Texting Base doesn't "blast out" spam en masse to contacts. More meaningful group texts can be sent to multiple contacts, including automated greetings and well wishes for birthdays, anniversaries or holidays. Texting Base also takes a direct, personal touch with bi-directional chat from a dedicated phone number instead of short codes. The system also places an emphasis on TCPA compliance, adding a suite of tools for duplicate contact or message detection and removal, opt-out functions, plus a dedicated compliance portal for safer management. I found out about Texting Base after one of my friends who is in mortgage banking used it for sending personalized text messages for follow ups, holidays and birthdays etc... He told me that it was the best thing he could have done for his business and that he was relying on texting instead of cold calling his leads. I am old school I prefer calling people and knocking on doors but most people return my voicemails with texts these days. So I reluctantly signed up for Texting Base and I found out I had to pick a new number which I thought was a little odd. I messaged their support using their support chat and they responded immediately. The told me that in order for their product to send messages at scheduled times and avoid overloading my phone with responses that I'd need a new number. They explained that I can still respond from my phone using their mobile version and that I'll receive a notification when someone responds. They recommended that I send my first message explaining to my contacts that I still have my other number and that this my new business texting line. I was very skeptical but I was already here so I decided to go for it. I sent out my first message and personalized it with their first name to my real estate leads about an open house I was having on Sunday. It was pretty nifty everyone got a message that unique with their first name and I was surprised only 12 of 343 contacts opted out. I had positive responses from almost everyone and I knew who to expect from the open house and who wouldn't be coming. My attendance doubled from the week before and I couldn't be happier. 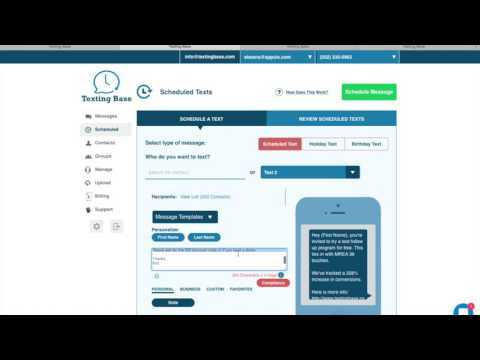 Bottom line: Texting Base works!Personalization and the ability to schedule messages. Personalization and the ability to schedule messages. Picking a new number which isn't as a big of a deal as I thought. None of my contacts were offended or caught off guard by my first message from Texting Base. If someone called the number it forwarded to my cell phone. No big deal at all! I found out about Texting Base after one of my friends who is in mortgage banking used it for sending personalized text messages for follow ups, holidays and birthdays etc... He told me that it was the best thing he could have done for his business and that he was relying on texting instead of cold calling his leads. I am old school I prefer calling people and knocking on doors but most people return my voicemails with texts these days. So I reluctantly signed up for Texting Base using a Personalization and scheduled messaging. Picking a new number but it's as big of a deal as I thought. None of my contacts were offended or caught off guard by it and if they call me it forwards to my cell phone number. I like the fact that you can set it and forget it. The automated texts go straight to their cell phones and they get it immediately. Clients will respond to a text even if they are in a meeting. The automatic feature is very helpful in Texas where texting and driving is against the law. Great to use from your desktop. I have already seen results from it and this is only my first month. The product support is fantastic and instantaneous. There may be other programs and apps out there but I don't think you will find any more rapid response than these guys. Texting is the least intrusive of all the contact forms and is much better than phone calls when your client may be in a meeting or working on a special project. I have a client who never responds to a phone call but has become actively engaged through texts. I have a listing appointment set up and she will probably be a buyer as well. To say that I am a supporter would be an understatement. The only minor thing is the fact that it has a delay of about 10 seconds to process the request from the keyboard. Something you get used to though. Its the only drawback I know of. Texting Base helped me keep in contact with almost 200 employees in the Houston area after Hurricane Harvey. It has a user-friendly website, and I was really impressed with the customer service. One of the co-founders even called me a couple days later to check on my employees after the storm. I would recommend Texting Base to anyone looking for an easy and cost effective way to communicate with any sized group. I needed this service specifically for an emergency situation but look forward to using it for many other types of messaging within my organization. I started with the free trial, but will gladly continue using Texting Base going forward. Engage customer contacts instead of blasting them with spam SMS texts, instead Texting Base's technology to personalize messages and automatically send socially valuable greetings for birthdays, anniversaries etc. With pricing packages available for 250 - 5,000,000 sent messages per month, users can send group texts to multiple recipients with ease and quickly import contact lists from CSV file. Geo-location awareness allows contacts to be sorted and organized according to proximity, particularly useful when targeting localized customers for certain campaigns. Texts can become more conversational with bi-directional chat capabilities, with messages sent from a dedicated phone number rather than a short code. Texting Base promises HIPAA and TCPA compliance to obey governing laws on text messaging, providing a suite of features and an administrator portal for trusted standards adherence. Below are some frequently asked questions for Texting Base. Q. What type of pricing plans does Texting Base offer? Q. Who are the typical users of Texting Base? Q. What languages does Texting Base support? Q. Does Texting Base support mobile devices? Q. Does Texting Base offer an API? No, Texting Base does not have an API available. Q. What other apps does Texting Base integrate with? Q. What level of support does Texting Base offer?